Summer is the perfect time to update your landscaping and give your outdoor living space a fresh new look. Here are the hottest landscaping trends to consider for your home. Hygge is a Danish concept that loosely translates to “coziness”. It can be applied to anything in life, including lifestyles, workplaces, interior design and landscaping. Hygge is a group of friends enjoying a board game over coffee, or downtime with a book on a cozy nook at home – anything that creates an intimate and comfortable kind of joy. Capturing hygge is a great way to use your outdoor living space. Install a fire pit with circular seating around it, or perhaps, an outdoor brick oven where you and your friends can gather for a fun night of homemade pizza. Add water features that produce soothing sounds, aromatic plants and flowers, warm outdoor lighting, and similar designs and embellishments that create a comforting atmosphere. With “greenery” named the Pantone Color of the Year, it’s time to turn your backyard into an all green oasis. Combine plantings of various shades of green, with different textures to create depth and variety. A greenery theme is timeless and will transcend trends, making it a lasting investment. With drought plaguing the South and other parts of the US, the new varieties of cultivated grass, called cultivars, offer smart alternatives. 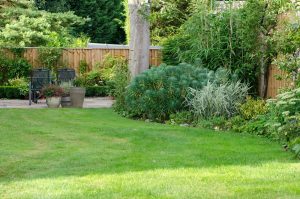 Thanks to selective breeding processes, these new grass varieties require less watering and maintenance, giving you a healthier lawn all year long. Smart gardening also means incorporating native plants and flowers, which can naturally thrive with the least tending. The bumble bee is now included in the endangered species list and the bee population in general is in decline. Many homeowners are doing their share to preserve these helpful creatures by making their gardens pollinator friendly. You can join the cause by having more native flowering plants that attract bees and other pollinators like butterflies and hummingbirds. Install birdbaths and other water sources for these pollinators, and avoid using pesticides. Grilling and neighborhood barbecues are Southern traditions, so it’s no surprise that today’s landscaping trends include fancy outdoor kitchens with the latest smart features. Ovens with WiFi, touchscreen refrigerators, mobile app-controlled surround sound – outdoor barbecues are no longer just about having a charcoal grill and a cooler full of beers. If you’re not inclined to spend thousands of dollars for hi-tech trappings, consider less costly upgrades, such as installing mood enhancing LED lights or adding a convenient prep area. Green roofs provide many benefits, including minimizing urban heat and helping in storm water management. They also offer great options as outdoor spaces in dense urban communities. Green roofs can be mostly seen today in commercial buildings, restaurants and even double-decker buses, but they can also be adopted in homes. Consider constructing a small rooftop patio or a terrace, add a few plants, or perhaps, a turf. A green roof will not only make your home pleasing to the eye, it can also help cool your interiors the natural way.